Watching your kids enjoy the slides, swings and other equipment at your favorite park or playground can be some of parenthood’s most rewarding moments. But Florida injury lawyers remind you that safety should be your first priority to ensure your child does not suffer a serious injury while at play. Emergency rooms across the country treat more than 200,000 children 14 years of age or younger for playground-related injuries, according to the Centers for Disease Control and Prevention. 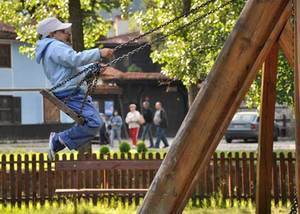 Most of those occur at public playgrounds, including schools and day care centers. Additionally, according to a new Children’s Hospital Medical Center of Cincinnati study of emergency department visits throughout the United States, injuries due to falls from playground equipment result in higher proportion of severe injuries than either bicycle or motor vehicle crashes. The number one cause of a child’s injuries on playground equipment is lack of adult supervision. Exuberant kids don’t have the ability to properly gauge distances, or foresee potential dangerous situations. Most kids will push their limits when using playground equipment, and proper adult supervision is key to a safe and enjoyable day at the park. Always make sure you have a clear line of sight between you and the apparatus your child is using, to properly monitor their safety. You also need to make sure the equipment is in proper working condition, free of any worn or loose parts, debris or water, which may cause a child to slip and fall off. Falling off playground equipment is the number one cause of injuries. Parents also need to make sure the equipment is appropriate for their child’s age – some equipment may look like fun to a younger child, but they may not be ready to use it safely. The surface underneath the playground equipment is also a very important factor to consider. Concrete, blacktop and asphalt are considered unsafe surfaces for playgrounds, and even a grass or dirt surfaces do not provide adequate cushioning in the event of a fall. The safest materials are safety-tested rubber mats, or loose filled materials such as shredded rubber, wood chips, mulch, sand or even pea gravel. Always make sure there is at least six inches of depth to provide a suitable cushion, and that the material extends at least six feet past the equipment on which it stands. Keep an eye out for dangerous items, such as broken glass or twisted metal, rocks, tree stumps and tree roots. A well-designed playground will have distinctly separate areas with equipment for younger and older children. Some climbing equipment and other things like seesaws or “teeter-totters” may not be suitable for younger kids. Check for rusted or worn parts, or equipment with protruding or jagged metal or wooden pieces. And of course, with the intense summer Florida sun, always make sure the surface is not so hot as to cause injury for a child. Stay away from hanging rope swings, which can fray or even form a noose and present a strangulation hazard. According to The National Program for Playground Safety, Florida playgrounds received an overall B+ grade on categories including park supervision, appropriate safety signage, age-appropriate design, fall surfacing and equipment maintenance, among others. Again, proper adult supervision is the single most important factor in making sure you and your child enjoy all of the playground’s equipment. A child may think they are capable of playing on a specific piece of equipment, only to have second thoughts once they climb aboard. Always stand nearby to provide a safe escape should your child decide that a particular ride is a little too much for him or her to handle safely.